d'aww, Teeko. She looks so happy! He has spent about half his life on a space station...not many places wide enough for flight and he didn't want to risk getting seen. Edit:Posted this running out the door so I didn't have time to make comments. Teeko does look happy. She's the type that's fun to watch since she's always enjoying herself. XD What kind of clothing does she want to wear? The only thing he'd feel remorseful about is the fact Val had basically rigged it from the start since they really dooo, need to eventually leaaave - meaning he loses.. all the time XD Side note: I like to think they bought some fancy men in black toy off the intergalactic interwebs that lets them erase peoples memories of the whole thing afterwards hehe. As an extra security caution. 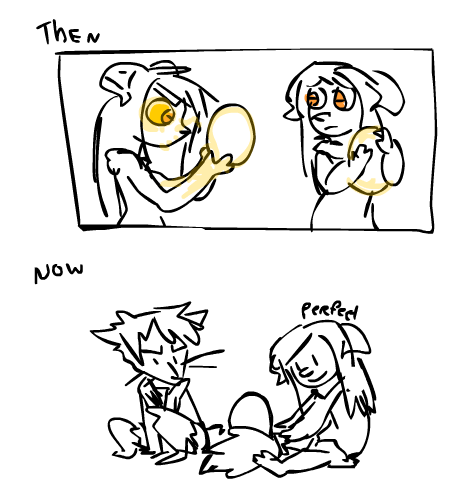 It's kind of funny that you asked, because earlier when I was brainstorming up the story in general I played with the idea of what if she found an egg - and her dragon's soul transferred into it so he'd have another dragon body to be inside of rather than her own. Kind of liked the idea of her friend being now stuck inside a defenseless egg that she now needed to care for and make sure would stay safe and well until it hatched! 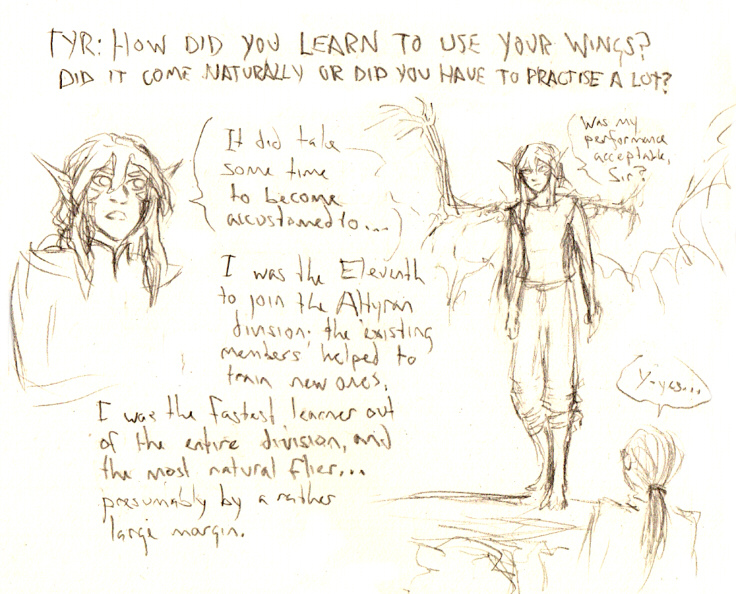 Tyr: How did you learn to use your wings? Did it come naturally or did you have to practice a lot? Kiran: Do you ever get really bad nightmares? 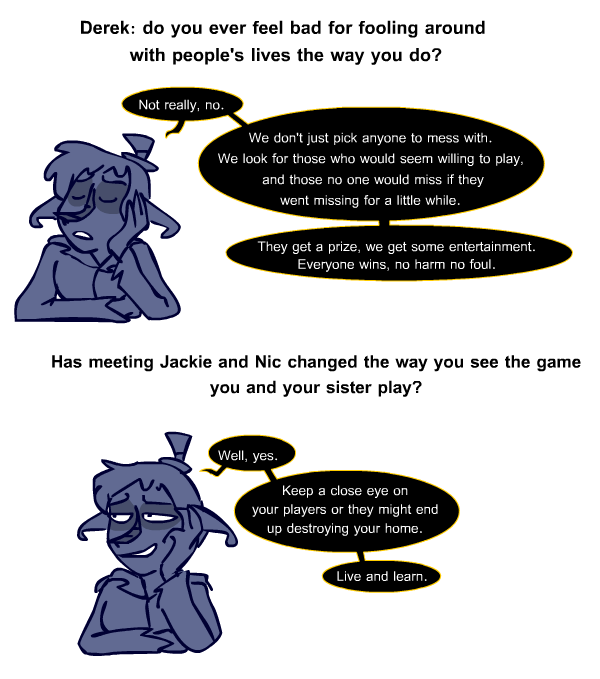 Jack: Do you ever go by 'Jackie' for a nickname? XD!! Sorry, that question is a bit silly one. I just find it funny to find another character here who shares my alien character's names eheh. Ryuu: Have you ever handled a situation in a way you later regretted? 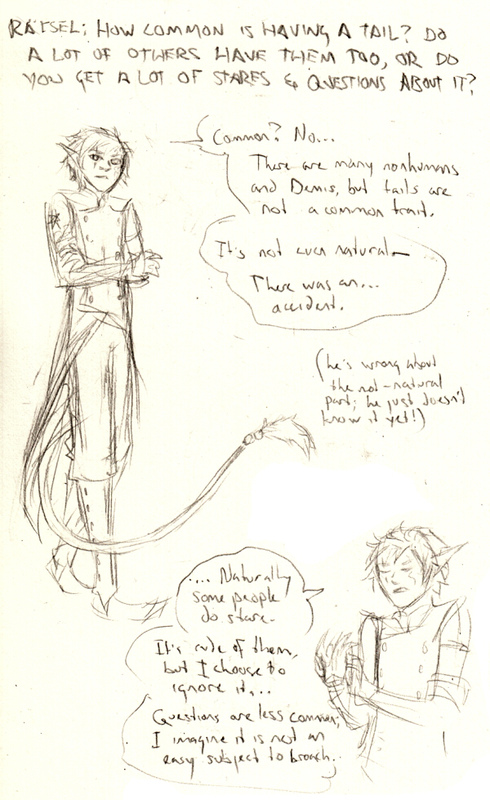 He was also the only Altyran to enjoy it (which probably had something to do with it). 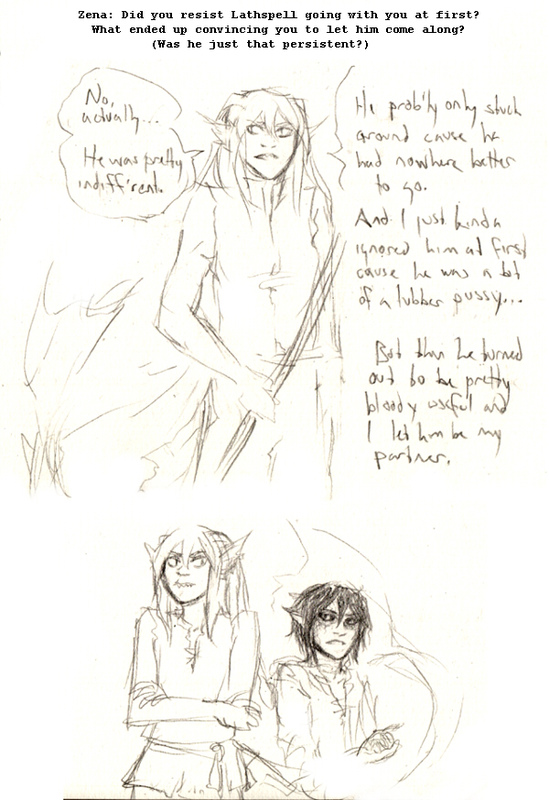 Delilah/Perdy: Perdy's Mistress orders him to steal the dragon egg for Nefarious Purposes. (Maybe she wants a dragon omelette?) What do you do? Perdy either then tries to take it back again, or just gives up and looks for another egg. 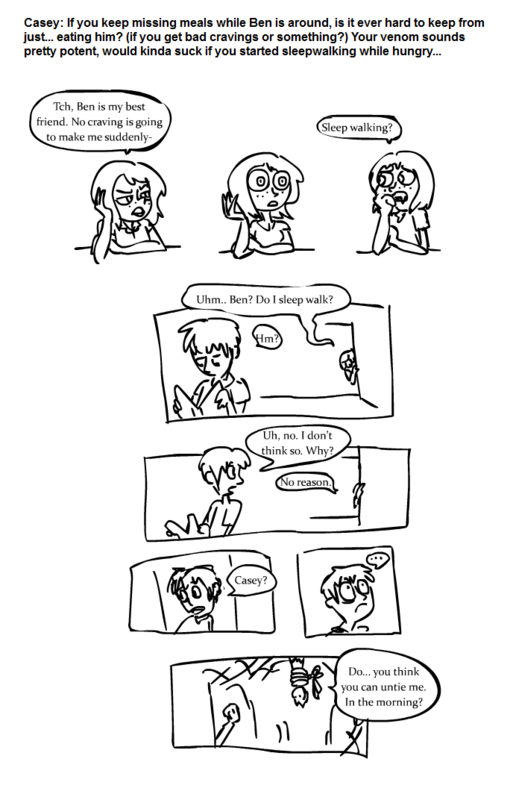 The funny thing is this is basically the second part of the story's plot in a nutshell XD! Dusk- (Zashret) What do you think is the most beautiful part of the desert you live in? (Zena) - What's your favorite swear word? Sky- (Jackie) Who gives the best hugs? Fast! You get another one then. 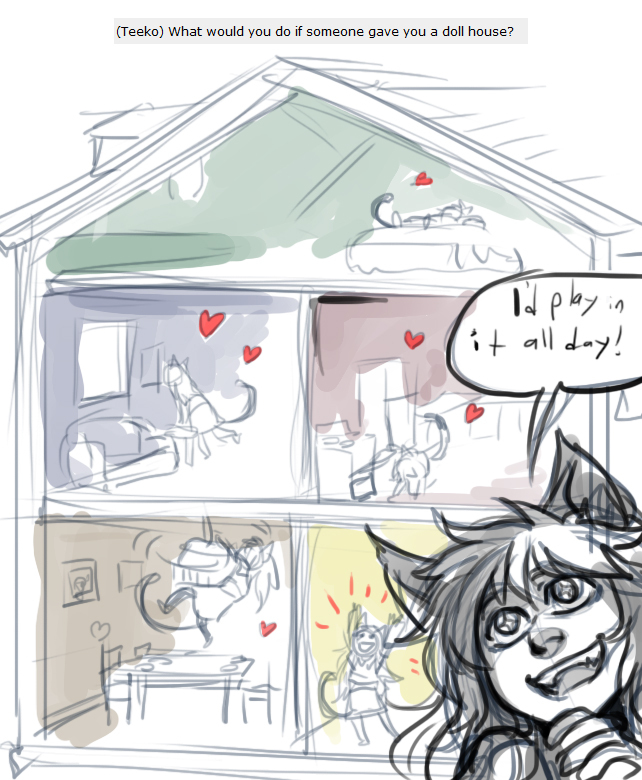 XD @Derek- What is the most unusual thing you have in your house (or that you have invented)? 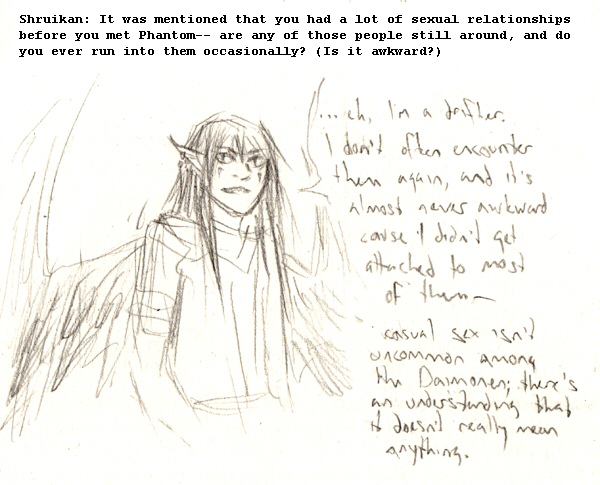 Wherein Kiran lies through his teeth. Jack: What's up with the power glove mechanical hand thing? 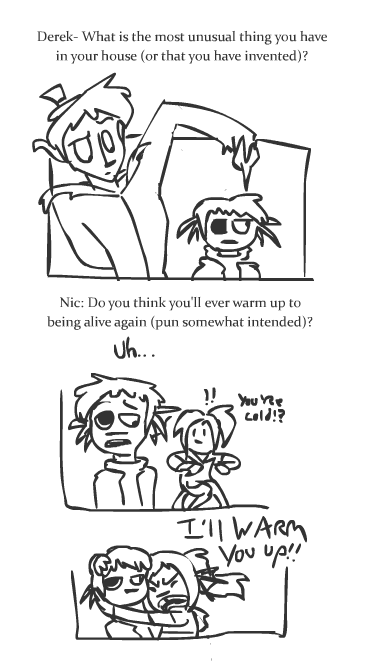 Nic: Do you think you'll ever warm up to being alive again (pun somewhat intended)? I updated the OP with some new victims characters :U Look at all these lovely characters available to torment ask! Turns out Zena thinks having 'favourite things' is stupid and she'll have no part of it. I think Nic... technically kinda counts as one of Derek's inventions also? Hehe - most strange because he's made duplicates of dead people before - but never before has their dead soul ever attached to the duplicate before. New discoveries! 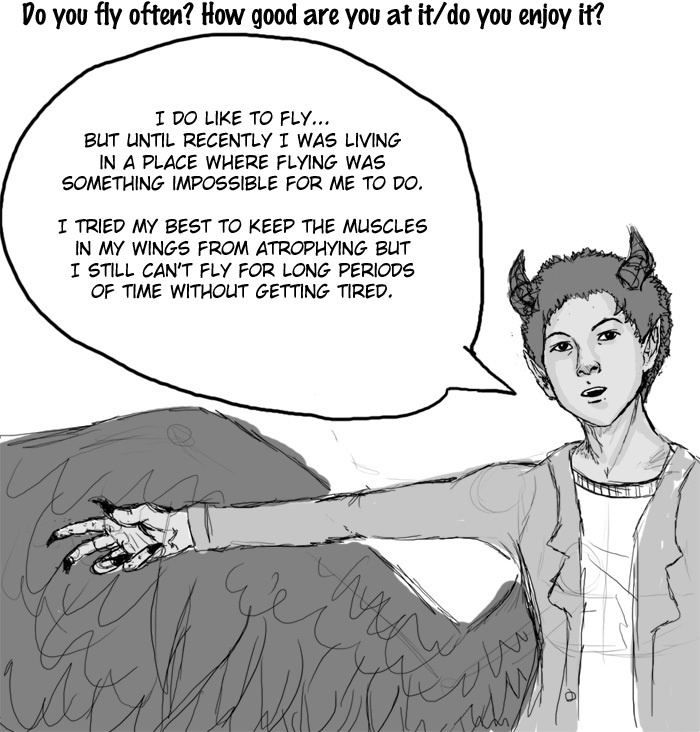 And another question for Mashi! 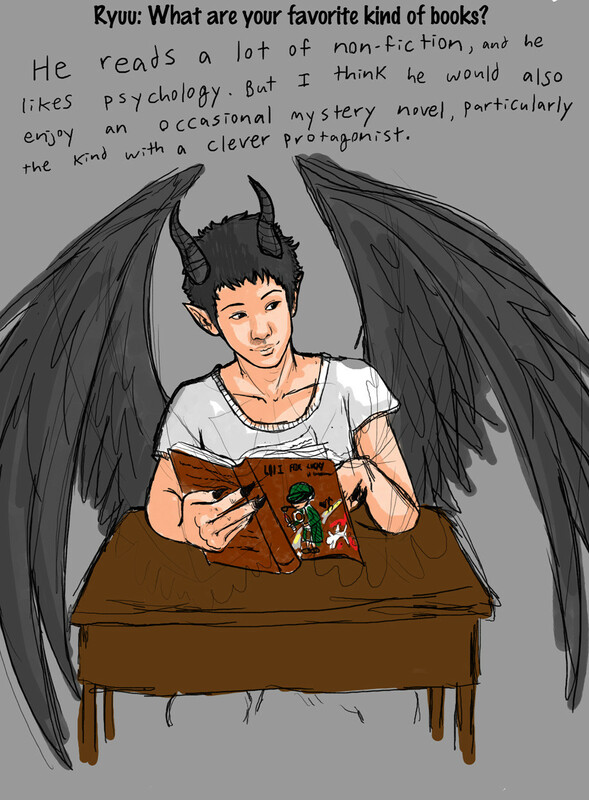 Ryuu - What are your favorite types of books? 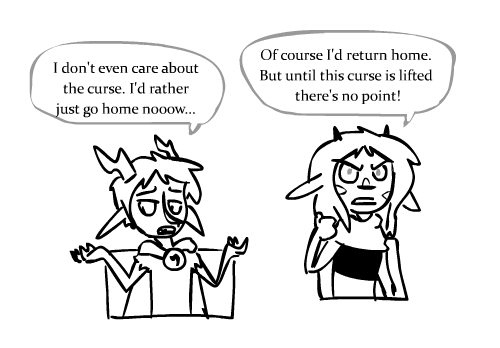 Drake and/or Oliv: what do you see yourselves doing once (if) the curse is lifted? Will you go back home? 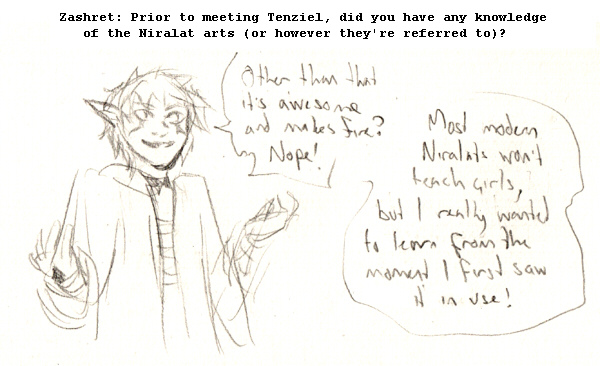 Zashret: Prior to meeting Tenziel, did you have any knowledge of the Niralat arts (or howvever they're referred to)? Nagino: Is there any source for your theory that staying in one of your forms long enough will cause it to stick? Old folk tale, some telling it as a joke when she was young and she believed it...? Breather is kind of a placeholder name I know it sounds kind of dumb. The planet they live on they can't breath the air without dying...anyway it's kind of like something in the air causes an allergic reaction in humans. You can get really sick staying outside and the thing on her arm essentially works like an insulin pump by monitoring her blood and pumping in more of a kind of antidote as she needs it. A lot of people use face masks instead of these but usually still get a little ill from the contact on their skin (although they will not die like they can from breathing the air, just feel kind of ill like that coming down with a cold feeling you can get from allergies). Indoors the air is filtered so it's safe and she doesn't need it. Hers is a pretty fancy model and can carry a computer AI as well. All of the half dragon characters don't need one other than her, she's just lucky... She's one of the few born without wings as well. 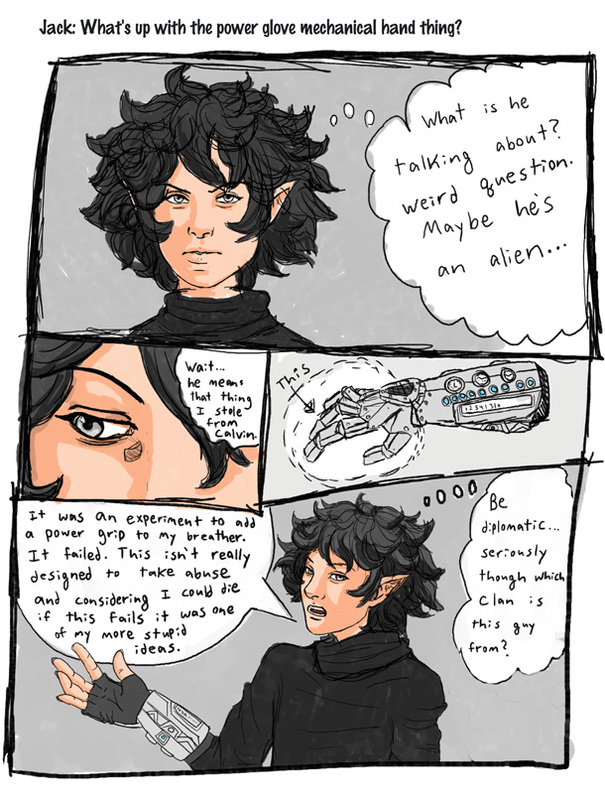 ^.^ Anyway Calvin who is one of them made the power glove thing as an experiment since it doesn't really matter to him if he breaks one of them since he can breath the air. He's always inventing or buying weird things and she will "borrow" them if they look like they might be useful (and she usually breaks them). Some questions for you toooo then! 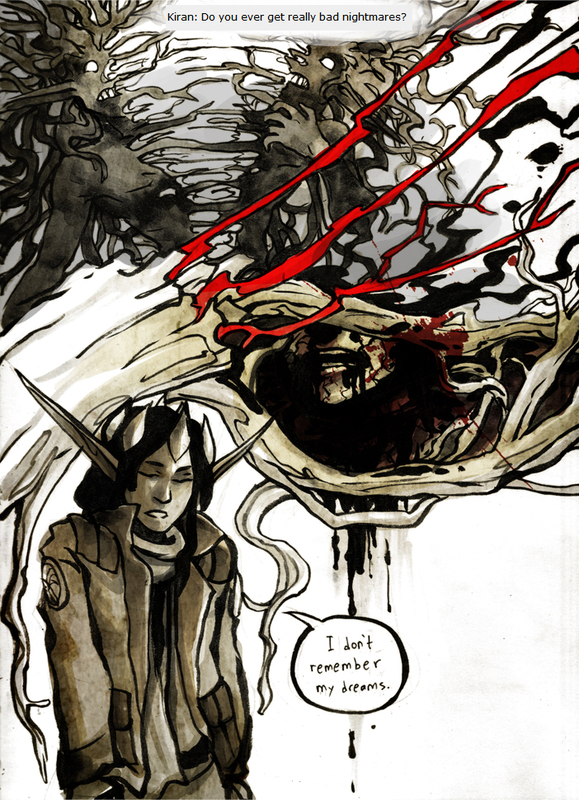 Kyte: Have you ever killed anyone? If not - could you see yourself as a killer? If you had to for self defense. Or even for possibly revenge? Younger Astrid: Where did you get that scarf. Also - why are you so adorable. The second one isn't actually a question, more of just a statement. Tell me about your scarf. Older Astrid: Do you still have that scarf. 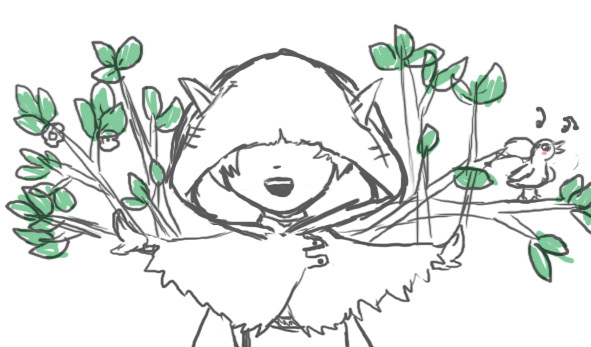 (Bonus) Scarf: How do you feel about Astrid. 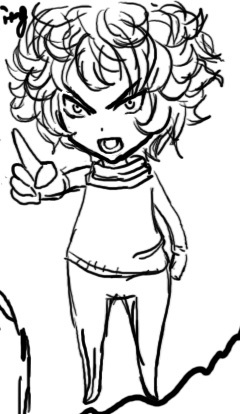 Oh yeah I forgot to ask; do you want Nagino added to the list, Selini? 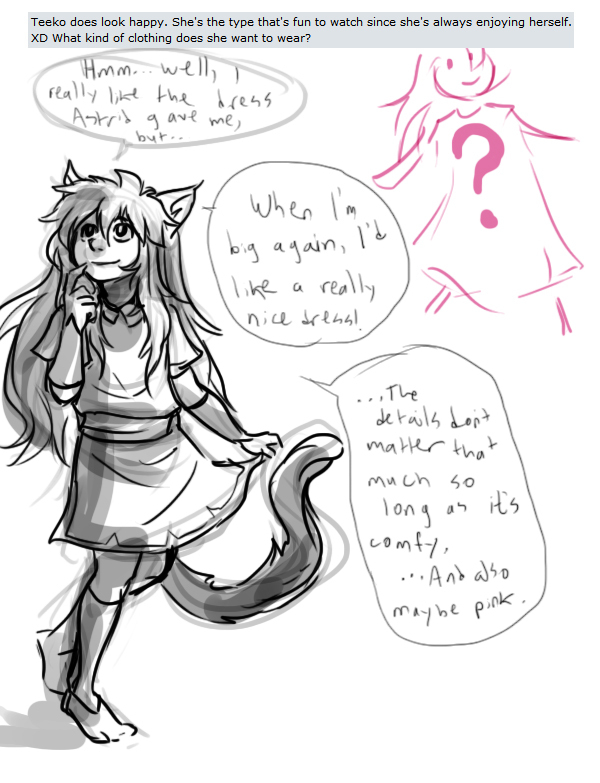 But it remains unknown... >< Same thing with staying in snake form. 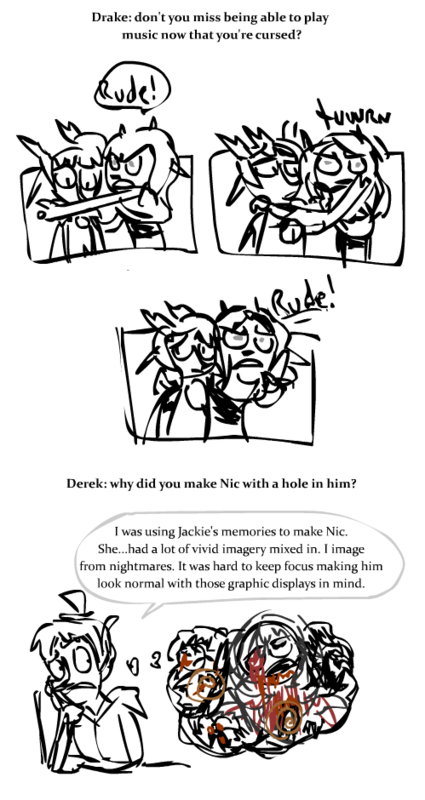 Derek: why did you make Nic with a hole in him? Drake: don't you miss being able to play music now that you're cursed? Casey (and Ben): is the existence of vampires and spider-people common knowledge to humans, or is it all a big secret? and if humans do know, do any of them try to hunt down and kill the nonhumans? 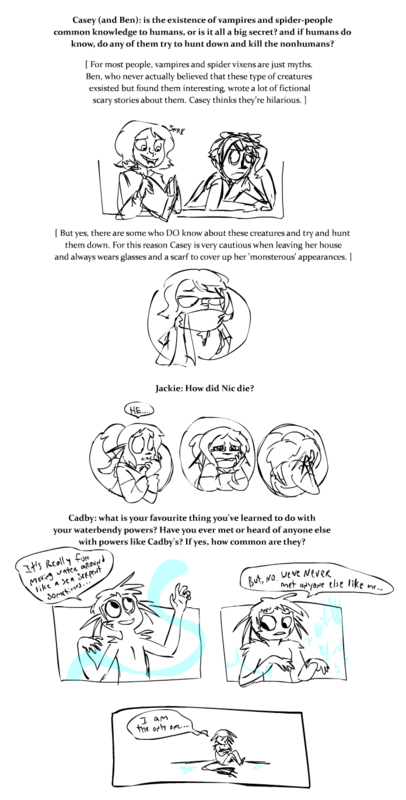 Jackie: How did Nic die? annnnd it seems the fishubros haven't had any yet!? Cadby: what is your favourite thing you've learned to do with your waterbendy powers? both: Have you ever met or heard of anyone else with powers like Cadby's? If yes, how common are they? I answered for him since he would probably say he likes all books. Or that he doesn't really have much time to read these days. It's definitely something he really enjoys but he doesn't really think about it that way. 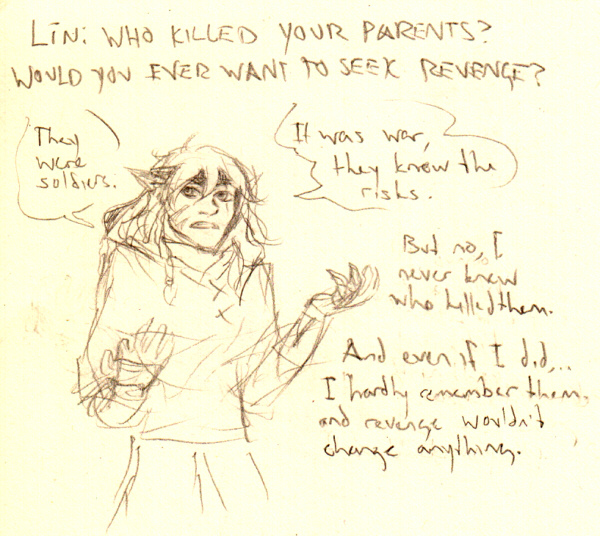 Lin: Do you know who killed your parents? Would you ever want to seek revenge? Spirit: Out of all the Master's you've had - who has been the worst? 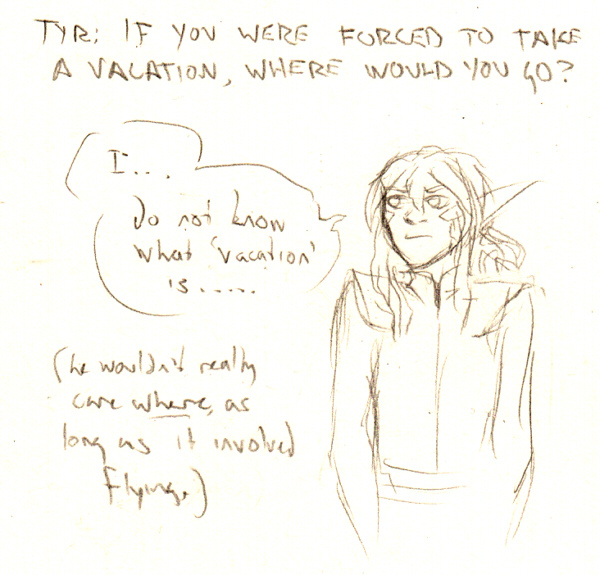 Tyr: If you were forced to take a vacation, where would you go? Doctor Rätsel: How common is having a tail? Do a lot of others have them too, or do you get a lot of stares and questions about it ever?